PEOPLE looking for a unique stocking filler this Christmas will find it in the form of a souvenir booklet unveiled last night by Moville St Patrick's Day committee. The attractive, limited-edition booklet, priced just €4, marks the committee's 25th Anniversary. It features a wide selection of material including extracts from minutes of meetings jotted down over the years; reflections by committee members and articles from local contributors. Readers can also enjoy a trip down memory lane while perusing a selection of great photos taken at various parades and associated events in the town over the past quarter century. "Consequently, it constitutes an important social and cultural document reflecting the history of certain aspects of life in the town during the past 25 years," said a committee spokesperson. Moville St Patrick's Day committee was founded in 1990 and has since been responsible for the town's very successful annual parade celebrating Ireland's patron saint. The booklet's official launch was scheduled to take place at a Pop-Up Museum last month but this unfortunately had to be postponed due to unforeseen circumstances. 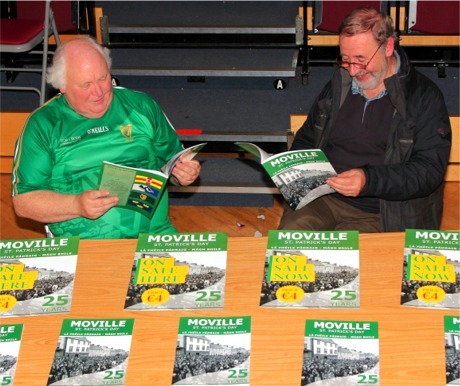 Hot off the press: Moville St Patrick's Day committee chairman Eamonn McLaughlin, left, and secretary Gerard Sona, look over their new Silver Jubilee booklet at an informal launch in St Eugene's Hall, Moville, on December 8, 2016. The official launch has been rescheduled for early next year but a less formal launch took place last night to allow the booklet's availability for the Christmas market. The committee, who tasked Browne's of Letterkenny with the printing, thanked everyone who contributed written articles, photographs and other general information. "(We) would particularly like to thank Leo McCauley for his input and a very special word of thanks to Cathar Sona who took responsibility for the general layout and graphic design, dedicating several hours to this onerous task," added the spokesperson. The spokesperson said that "given the mass amount of emigration from the locality some people might wish to purchase a few copies to send to family and friends abroad and also keep a copy for themselves so (we) deliberately kept the price to a minimum to facilitate this and to give people a wee bargain at Christmas when the purse strings might already be under severe pressure." The keepsake booklet, is currently available in several local outlets and from any of the following committee members: Eamon McLaughlin, Gerard Sona, Audrey Bredin, John Canning, Joe Bredin, Paddy Kearney and Martin McColgan. Sales are swift so you need to be quick. You can also contact eamonmclaughlin@gmail.com .